Today at the Made in America Facebook page it’s ETHAN STOWELL day! If you haven’t already visited Facebook/MadeinAmericaCookBook and liked our page please do – we need to know you like us in that Sally Fields way. 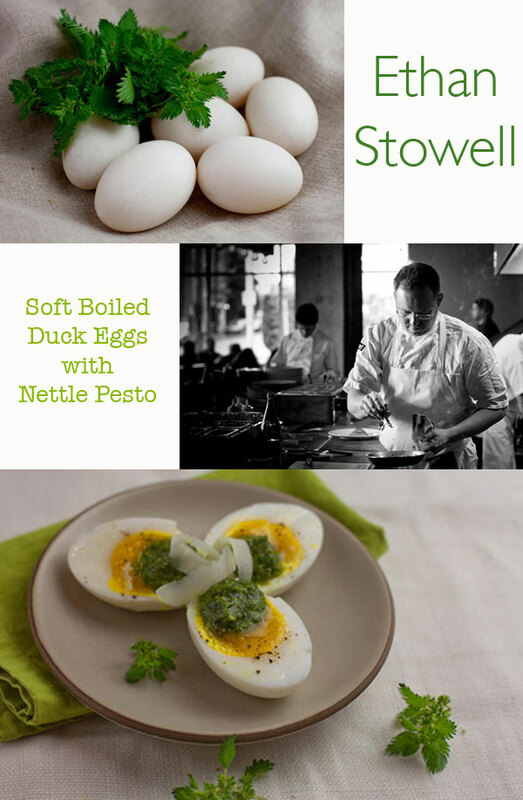 I chose the duck eggs with nettle pesto and porcini – this decision was made based balancing the other recipes I already had for the book from the other great chefs around the country. I’m curious to explore the other combinations he suggested though – especially the nettle and ricotta agnolotti – but that will have to wait – back to boiled eggs. 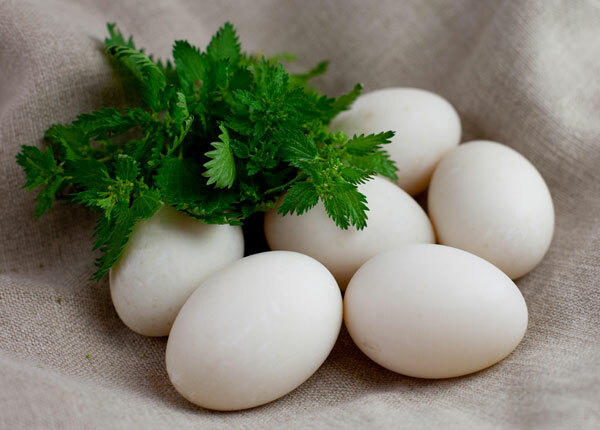 I love boiled eggs – chickens eggs that is – and was thrilled to have this opportunity to explore soft boiling duck eggs. I bought beautiful duck eggs and nettles at the Santa Monica Farmers’ Market. Despite getting a nasty sting I’d do Stowell’s recipe again in a second – it’s such a tasty simple recipe and the kids gobbled it all up – pesto, porcini, duck eggs and all. Stowell recommends boiling the water and the vinegar first and then carefully adding the eggs. When I boil I like to place the eggs in the room temperature water and then bring it to a boil. I find they are less prone to cracking. I then time exactly 5 minutes from a rolling boil to get the perfect soft boiled chicken’s egg, immediately remove from the water with a slated spoon and place in the egg cups. It’s important to stop them cooking – a quick swipe to the top with a large knife to reveal the deep yellow yolks and they are ready. 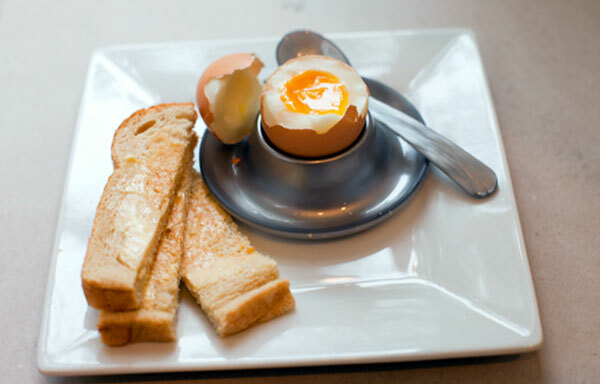 I serve them in these cool egg cups which we bought in Paris last year with a side of hot buttered toast cut into ‘soldiers’ for that all important dipping. Boiled eggs, chicken or duck (or if you are feeling really adventurous how about tiny quail’s eggs?) are the perfect breakfast that can be served at anytime of the night or day. « Ludo Bites America – Happy 4th! Thank you for this recipe! I love hard boiled eggs, but have such a problem with the shell sticking to the white. I’ll try your method. Also, which farmer at the SM market sells duck eggs? Duck eggs are one of my favorite things in the universe. 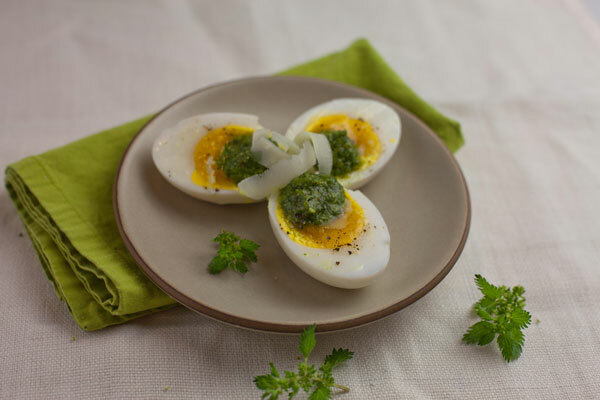 They’re so rich and flavorful… and the simplicity of a boiled egg is Mother Nature’s gift to the world. I could live on hardboiled eggs alone. A nettle pesto? How fabulous & intriguing. Like the idea of it over eggs. Perfect supper – mmmm – duck egg carbonara sounds very appealing… with the pesto thrown in for good measure! Poached eggs are the perfect food. Period. I love your soft-boil egg cups. Perfect for keeping your fingers safe and the eating fun!